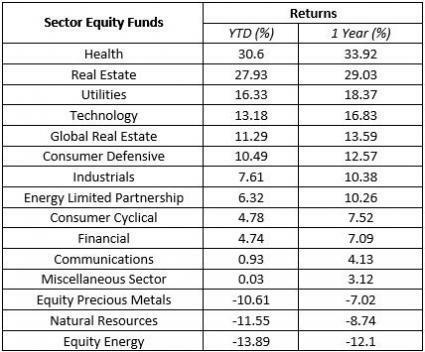 We will be picking the top 3 Real Estate funds this year based on their year-to-date returns and favorable Zacks Mutual Fund Rank among others. However, before doing so, let's look at the positives for the sector. PIMCO Real Estate Real Return Strategy D (MUTF:PETDX) seeks to provide maximum real return. The fund invests in real estate-linked derivatives and a basket of inflation-indexed securities to achieve its investment objective. It also invests in Fixed Income Instruments including bonds and debt instruments issued by domestic or foreign public and private sector entities. Oppenheimer Real Estate Y (MUTF:OREYX) invests majority of its assets in real estate companies. These companies either invest at least half of their assets or earn 50% of their revenues from ownership, construction, financing, or sale of commercial, industrial or residential real estate. The fund may invest both in real estate investment trusts (REITs) and real estate operating companies (REOCs). Fidelity Series Real Estate Equity F (MUTF:FREFX) seeks capital appreciation over the long term and above-average income. The fund invests a lion's share of its assets equities primarily from the real estate industry or other real estate related investments. The fund aims to provide yield higher than that of the S&P 500 Index's composite yield. The fund invests in both domestic and non-US issuers.